Ever wonder what might be lurking below the water’s surface? Turns out, there’s much more in there than you might think! The Cotton Family Wetlands has been providing guests with the opportunity to immerse themselves in a wetland habitat since 2012. The more than 200 feet of Trex decking walkways of the boardwalk (made from recycled plastic grocery bags and reclaimed hardwood) cross the 1.7-acre pond and wetland to bring us to the heart of this incredibly diverse habitat. Native fish, frogs, turtles and birds are relatively easy to spot. However, some inhabitants require a closer look. The wetland is teeming with macroinvertebrates – organisms without backbones that live in water habitats. Our Volunteen Zoo Corps has been providing opportunities for guests to observe these incredible creatures through carefully collected water samples from the benthic zone of the wetland. The benthic zone is the lowest level of a body of water. Everything that is collected is returned directly to where it came from at the end of each shift. Macroinvertebrates are present in pretty much all natural bodies of water. They are bioindicator species, meaning that some species are especially sensitive to changes in their habitat. We can count which species we find and know the general health of a body of water if the more sensitive species are present or absent. Our wetland happens to be in great shape, with a very diverse group of macroinvertebrates. If you’re interested in learning more, there are several citizen science groups where you can join in on group studies. Friends of the Rouge is a local group that schedules benthic sampling a couple of times a year and recruits volunteers to help: http://therouge.org/fotrprograms/benthic-macroinvertebrate-sampling/. 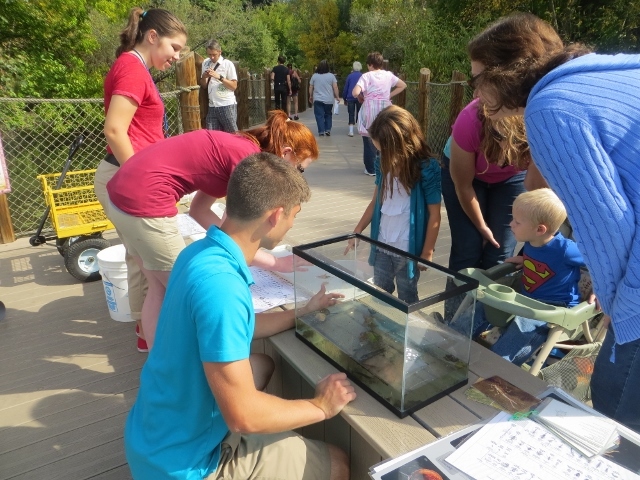 Our Volunteens will be on the boardwalk during MemberFest and several weekends between now and early October if you would like to explore the Zoo wetland residents. For more information about how to join our Volunteen Zoo Corps Program, visit: http://www.detroitzoo.org/Volunteers/volunteering-detroit-zoo. She was standing still, in front of an expansive vista full of greenery. Her eyes bounced from place to place, noting the tiered stream and pools, the variety in shrubbery and trees, and the rocky outcroppings. Sensing movement to her left, she turned to get a better look, and, through the trees she spotted Kaska, a male gray wolf with a coat of dark, smoky fur, exiting the den. Wazi, a 7-year-old female gray wolf, is often seen exploring the terrain of her new home in the 2-acre Cotton Family Wolf Wilderness. Since it’s opening in early June, staff from the Center for Zoo Animal Welfare have been observing what the two wolves are doing and where they are spending their time as they acclimate to their new habitat at the Detroit Zoo. As the wolves interact with each other and explore their surroundings, we learn what matters to them. The process by which zoo habitats are designed is lengthy and meticulous. When architects design a home or an office building, they can talk to their clients to make sure that the design encompasses all of their wishes and meets all of their needs. When we are designing spaces for animals, we do not have the luxury of asking them questions directly. We have to rely on our understanding of the ecology and behavior of the species in question. We engage experts and ultimately construct habitats that we believe will not only meet, but exceed the needs of the animals that will inhabit them. We include opportunities for each animal to engage in species-typical behaviors, to seek shelter and privacy when desired, and to exert some measure of choice and control over their daily lives. When all is said and done, we must rely on what the animals “tell” us about their environment and make any adjustments accordingly. As we do with all the animals, we will continue to find ways to learn what Wazi and Kaska think about their home and their lives. Did you know that U.S. consumers go through 1,500 bottles of water every second? Of those 1,500 bottles, only 300 of them will be recycled. Unnecessary plastic pollution is a big reason why the Detroit Zoological Society is taking the bold step of phasing out the sale of bottled water – but it’s not the only reason. When diving into this issue, we’ve also learned that most brand-named bottled water comes directly from the tap, our Great Lakes or even the Detroit River – costing consumers around 10,000 times the cost of tap water and diverting massive amounts of fresh water from the Great Lakes basin. In addition, there are an incredible amount of resources that go into producing one bottle of water and that single-use product remains in our environment anywhere from 500 to 1000 years. 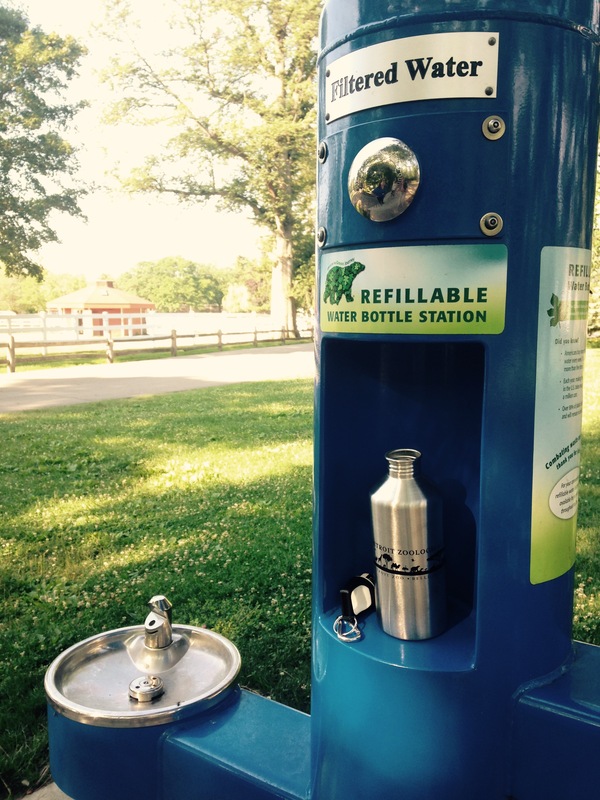 As of September 2015, the Detroit Zoo will no longer sell bottled water. 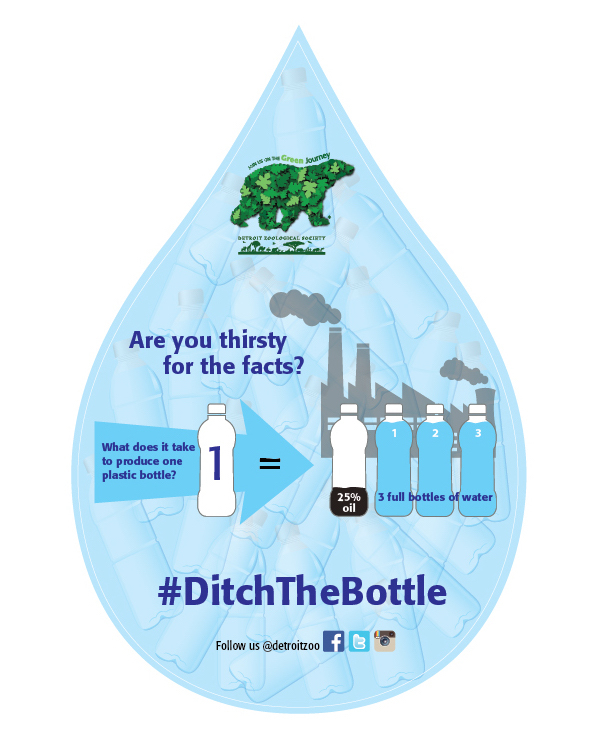 We ask that you join us to #ditchthebottle here at the Zoo and in your everyday lives. We encourage you bring reusable containers that can be refilled – for free – at any of our 20 refill stations during your visits to the Zoo. To help with this transition, we’re also offering a reusable sports drink container at all our major concessions, which costs less than bottled water. Help us spread this message! We’ll be giving away two of our premium stainless steel reusable water bottles to our supporters. To win this reusable drink container, please connect with the Detroit Zoo on social media and share a photo of a place you would like to keep clean from plastic pollution. Tag the photo with #ditchthebottle and @detroitzoo on Facebook, Instagram or Twitter. The Zoo’s Green Team will pick two winners on July 14.